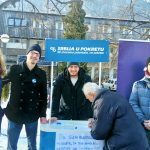 Mali Zvornik, January 31st – The citizens of Mali Zvornik were glad to hear that soon they would have the opportunity to speak to the MPs. 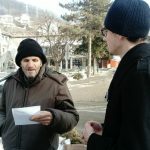 Ad Drinum, Serbia on the Move’s team from Mali Zvornik that is engaged in the „I Choose Whom I choose“ initiative, talked to their fellow citizens about the local environment problems about whic they would like to inform the MPs. 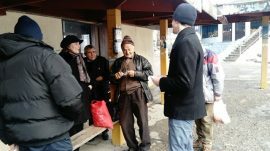 The action „Would You Meet an MP?“ was organized at the city bus station and over 50 citizens of Mali Zvornik were supportive about the possibility of an MP coming to their town. The Ad Drinum team introduced their fellow citizens with the „I Choose Whom I Choose“ initiative through conversation and additional information material. They informed them about the election system reform that the initiative suggests and about the ways thay get engaged in the initiaitive. The team also announced the establishing of the MP Office in Mali Zvornik during March, when the citizens will have teh opportunity to talk to the Parliament representatives about the local problems and demand of him or her to speak about it during the MP uestions Day at the Parliament. Speaking of problems, difficulties with the heating plant, disfunctional streat light and inadequate snow plowing machinery are the biggest troubles in everyday life of Mali Zvornik, according to its citizens. Before meeting wth the MP, they will have the opportunity to state wtheir will egarding these topics during dotmocracy , which will be organized in Mali Zvornik during next week. “I Choose Whom I Choose” is the initiative for Serbian election system reform that is carried out by the citizens of twelve cities, gathered around the National Coalition for Decentralization, Media and Reform Center Niš and CSO Serbia on the Move. Induced by the fact that citizens don’t choose their representatives in the Parliament, but the political parties are making that choice instead because the malfunctioning election system allows them to, the activists inform their fellow citizens about the flaws of the current election system and motivate them to join the initiative. The goal of the initiative is to reform the election system in Serbia in order to provide equitable geographic representation of citizens in the Pariament, accountability of chosen representatives, gender equality in the Parliament and representation of minority groups and communities. 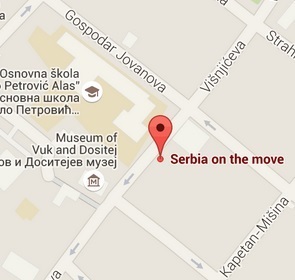 Belgrade Burdened with Urban Development ProblemsHave You Heard of Dotmocracy?